With a sticky political situation, travel to Israel and the Palestinian Territories isn’t as straightforward as, say, a Schengen Zone country in Europe. It’s outside the scope of this blog to comment on the complexities of the situation, but we do feel it necessary to share general guidelines for entering and exiting the country. The whole of Israel is mainly served by Ben Gurion Airport in Tel Aviv; nearly all international flights will arrive here. When making arrival plans, be prepared to spend a lengthy time going through passport control. We were detained for several hours in a holding area (with many others) while agents vetted our information. It can be seemingly arbitrary which people are detained, but in our case, having the last name “Nassiri” and honestly answering what country my father is from (Iran) definitely flagged us for increased scrutiny. Be prepared to account for your stay by showing detailed travel plans (hotels, or names of people you plan to stay with) to help expedite the process. If Jerusalem is your destination, there is a public train that runs regularly, but a better and more convenient option might be a shared taxi (sherut). There will be many waiting and they’ll run when full. The advantage over the train is that you can tell your taxi driver exactly where to drop you off. A taxi will run about 60 shekels per person. The train only costs 20 shekels per person, however the drop off location isn’t convenient and likely means you’ll be spending money on a taxi anyway. By land you can enter and exit Israel at Egypt’s Taba border crossing and Jordan’s Allenby/King Hussein Bridge and Yitzhak Rabin/Wadi Araba crossings, north and south of the Dead Sea, respectively. The border with Lebanon is closed, and the border with Syria is difficult to cross, and inadvisable due to the ongoing conflict there. Because of the political situation between Israel and Palestine, many other countries forbid entry if you have an Israeli stamp in your passport. The list includes Lebanon, Syria, Yemen, Iran, Libya, Kuwait and Sudan. Other nations such as Saudi Arabia, United Arab Emirates, Oman and Qatar, Indonesia, and Malaysia may also be problematic, although it seems selectively applied. If any of these nations are on your future travels list, it may be wise to adopt a strategy for entering and exiting Israel without getting stamped. Israel accommodates this by stamping a printed visa card that you keep with you at all times with your passport. Upon exit you have that paper stamped, and your passport will never show signs of Israeli visit, that is, unless you entered or exited by land in Egypt or Jordan. Then you’ll have to try to negotiate with the agent on that side of the border to not stamp you as well. Scrutinizing customs agents will see that stamp from the Egypt or Jordan borders and know you were in Israel. One strategy is to obtain a second passport. 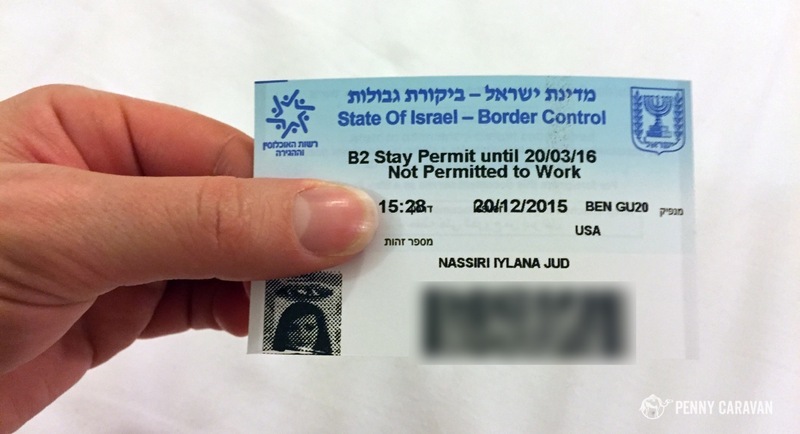 This is an excellent blog post that details more about how to avoid evidence of a trip to Israel in your passport. Walking across the border to Jordan. As mentioned above, we were detained coming in, but after that hold up we had the visa paper issued and stamped. After our time in Israel, we took a bus to Eilat with plans to cross into Jordan on foot at the Wadi Araba border crossing. We planned on having the visa slip stamped on exit and then talking with the Jordan agent about stamping a separate page as well. However the Israeli agent had other ideas! He stamped our passports with an exit stamp before we could even object, making any discussion with the Jordan agents moot. We just assumed he would stamp the visa slip, so be sure to make your desire clear. As for the Wadi Araba border crossing, other than getting our passports stamped, everything else went without a hitch. From Eilat we took a taxi to the crossing (about 10 minute drive). We then followed a fairly standard procedure, walking to the Israeli station, showing our documents, paying the exit tax, then moving through gates to the Jordan office. There they scanned our bags, checked our documents and ushered us through. One thing to note: there was no ATM on the Jordan side, so we had no Jordanian Dinar to pay a taxi driver there to take us to Aqaba. Fortunately he was understanding and helped us find an ATM in the city. In conclusion: Unfortunately, political realities sometimes get in the way of well-intended travelers. It’s best to do thorough research before arriving so you know what to expect. Consider whether obtaining a second passport is a good idea for you, and think ahead on what your future travels will look like. With a little bit of planning, you’ll be able to navigate sticky customs issues and arrive at your destination worry-free! I really hope the extra complexity doesn’t dissuade anyone from visiting Israel, Palestine, Jordan and – maybe on a separate trip to make the passport issue easier – Iran. Funnily enough, when I was in Iran I met some Iranians who had been to Israel, but of course before 1979. They were quite interested to hear my more recent travel stories from Israel. Thanks for the helpful advice! Above all, we want everyone to know the world is more open than it is closed!